Some times, you have to clear the cache to resolve cache corruption issue. Delete all the files under Cache folder to resolve this issue. Possible symptoms of corrupted cache are: Incorrect custom field values, not able to connect MS Project Server, Unable to open project plan etc. You can use following steps listed below to resolve the cache corruption issue. 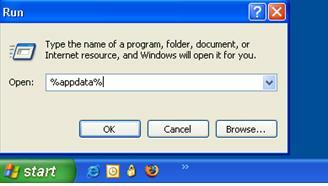 Type %appdata% and click on "OK"
Now you can try again to open MS project plan.